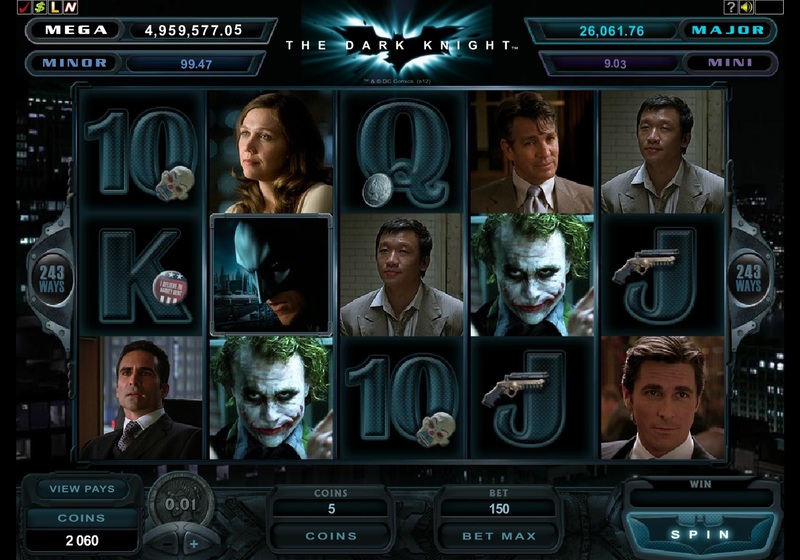 When it comes to big releases, they don’t get much bigger than Microgaming’s Dark Knight online slot game. Lots of us have enjoyed the movies starring Christian Bale and the late Heath Ledger, so there was plenty of enthusiasm for a slot game following a similar theme. I take my hat off to Microgaming they have done a fantastic job with The Dark Knight, which is graphically and audibly one of the best games I think I have ever played. However, the question has been raised, do the chances to win big stand up to the entertainment of this slot. That for me is still undecided. The Dark Knight is a 5 reel, 243 pay line slot with stacked wild symbols, a free spins bonus, random rewards and a progressive jackpot ticker for good measure. It is feature-rich with several random visits from Batman and The Joker during play, rewarding extra wilds symbols and occasionally whole wild reels as you will see in the video on the next tab. The free spins are rewarded for 3 or more scatters anywhere on screen, giving you a minimum of 15 free spins at 2x. 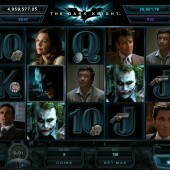 Extra free spins and multipliers can be awarded throughout the bonus feature by appearances from Batman and The Joker. Sounds great, but I have yet to receive anything bigger than 50x during this feature and I have played this game a lot! The progressive jackpot has four levels and can be awarded at any time regardless of the coin size you are playing. Expect to win the minor or mini jackpots most often, which are the smaller of the four on offer. I want to say a little bit about the actual gameplay. The graphics are amazing and I don’t say that very often. Those that recall Lord of the Rings slot will remember the cinematic shots behind the reels, which feature in the Dark Knight as well. I love all the movie noises, they make the whole experience that much more dramatic. The Dark Knight has yet to prove to me that I can win big, but in terms of gameplay and experience this is first class. I have no idea why Microgaming has set such a low value for the maximum number of coins you can play, this seems to be an oversight. Unless it has something to do with the progressive, which may mean they had no choice. High rollers will lose interest quite quickly, but most normal players should enjoy the experience. For US players, you will not be able to play this slot online for real money unfortunately. This is to do with Fedral laws regarding online gaming and not the decision of the manufacturer.